Grand Copthorne Waterfront has unveiled Grissini, their new modern Italian dining destination. Located in the ground floor, this modern setting Italian restaurant is inspired from the popular dipping stick / breadstick, originated from Turin. Though the décor of the restaurant is modern, Grissini still served the authentic Italian cuisine. True to its name, appetizer here are breadsticks. They are freshly baked and crisp, served with sundried tomatoes, basil and mayonnaise aioli. It was just simply too addictive, I have to stop myself from overeating. Following the traditional dining customs, we started the dinner with Charcuterie Platter, Prosciutto Di Parma ($16). Thinly sliced parma ham, served with parmesan cheese and breadstick. The fig and fruit jelly on the side gave a contrasting flavour to the salty and complex texture of the parma ham. Not to be miss are their cheese. 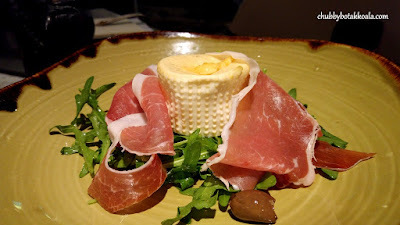 We had Smoked Cheese Salad ($26) and Cheese with Parma Ham- ($26). The creamy and delicate burrata cheese in a Mozzarella pouch is smoked to intensify the flavour. The parma ham, rocket salad and premium extra virgin olive oil complemented the cheese beautifully. Meanwhile the Cheese with Parma Ham salad, the parma ham was wrap around buffalo mozzarella then pan fried. Resulting in crispy texture, with creamy and gooey interior. Served with baby rocket and crushed Taggiasca olives. Though I am not an olive fans except in oil form, I can appreciate the flavour on this salad. For those who like something light and refreshing, the Heirloom Tomato Salad ($24) will be a good option. The sliced tomatoes are sweet and the juice just burst out when you bit into it. The olive add the salty contrasting flavour to the dish, while the extra virgin olive oil with shaved parmesan bind the dish together. A true summer salad. Moving on the next stage of Italian dining experience to pasta. Mushroom Risotto ($24). Al dente rice soaked up the robust porcini mushroom broth. Although the traditionalist Italian does not use butter in their risotto, it does not bother me. What I looked for is the thick, creamy, cheesy risotto and I got mine here. Yum Yum. Tortelli Veal Cheek ($24). Italian version of wanton, filled with veal cheek. The pasta sheets are consistently thin and good springy texture to it, while the veal cheek is just succulent filled with burst of flavour. Covered with rich buttery taste and rich parmesan cheese, it really enhanced the 'Italian Wanton' experience. Spaghetti Clams ($24). One of my favourite pasta. The clams are fresh, plump, sweet and juicy. While the finishing touch of Sicilian Extra Virgin Olive Oil, definitely take this dish to another level. Boston Lobster Linguine ($36). 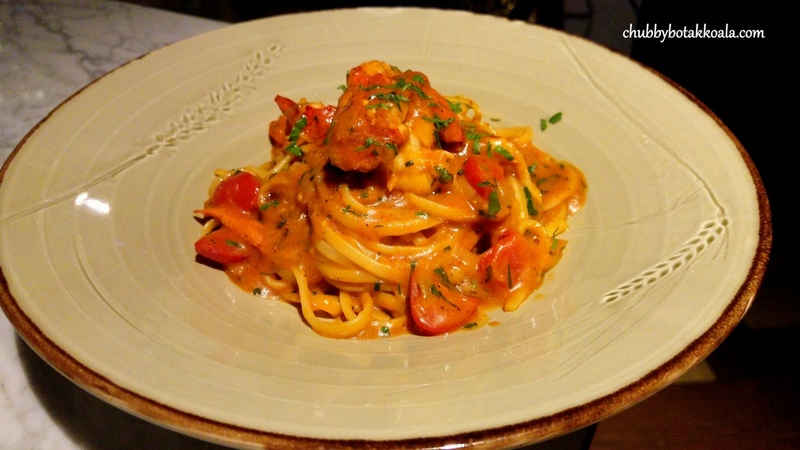 The al dente artisanal linguine is well coated with rich tomato base sauce. The mini tomatoes add to the tanginess of the dish, to balance the sweet and brainy flavour from the lobster. I wish there was just more lobster meat in it. The main dishes cooked using Josper oven (known as the combination of grill and oven in a single machine) is something to look forward to. Josper oven burned top quality charcoal, which will lock in the moisture and flavour in the meat or other protein that you cook with it. Truly a Chef's toy. Octopus (grilled - $36) is definitely not to be missed. It is thick, tender, and succulent with a touch of springiness in it. For BBQ lovers, the intense charcoal aroma will definitely wake up your appetite. Simply served with baby rocket and roasted potatoes, it was an amazing simple delicacy. Wagyu Ribeye ($78). Nicely marbled ribeye with was juicy and meaty. The josper oven seal the juice perfectly, it just melts in your mouth. I only wish that the cut of the meat can be thicker. Spring Chicken ($38). This mini chick is just succulent. You can actually taste the chicken without any seasoning at all, except for the aromatic charred. Simple and delicious, although it can do with a touch more of seasoning. Ending the evening with a sweet note were Chocolate Tart ($14), Limoncello Tiramisu ($14) and assorted Gelato ($8 per scoop). The chocolate tart is filled with warm hazelnut and light chocolate cream. The crust of the tart is crispy, the chocolate twirl and Pistachio Ice Cream made it a complete dessert. 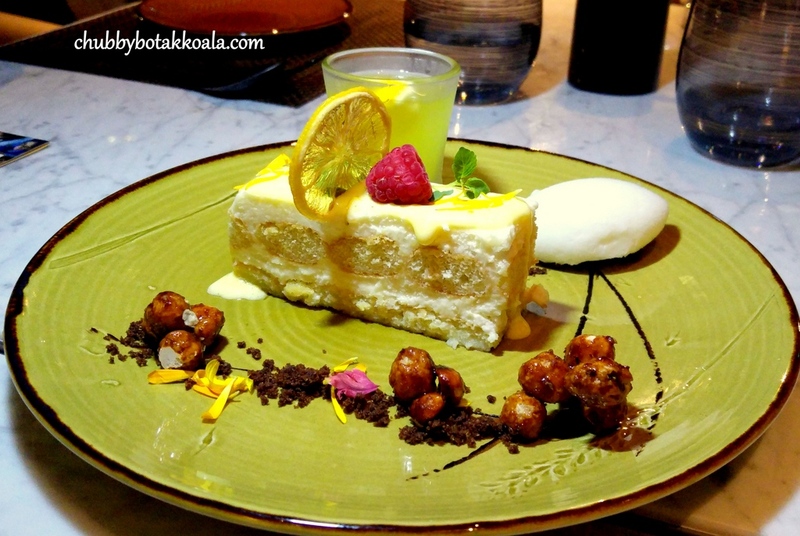 Limoncello Tiramisu, a different version of the regular tiramisu that we have come to known. Using the lemon liqueur instead of coffee liqueor, this tiramisu is sweet with a hint of tanginess. The sweet hazelnut chocolate provided a contrasting texture, while the lemon sorbet definitely give you a tangy refreshing feel to end your meal. Meanwhile, if you prefer something simple, check out the range of artisan gelato that they served here. Using commonly found ingredients and spices that use on the savoury cooking, and turning it into a gelato is just interesting. I sample the Parmesan, Basil, Black Truffle Oil, Balsamic Vinegar and Sundried Tomatoes. Though I don't agree with the flavours, it is definitely interesting. Overall, Grissini is definitely a place to go for traditional Italian food in modern settings. All of the items on the menu are worth trying, I don't even know where to start. 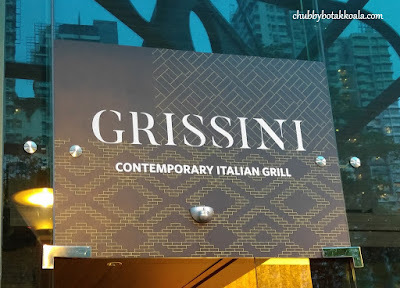 So check out Grissini or Grand Copthorne Waterfront Borderless Brunch in my next review. Saluti!! Cheers! !